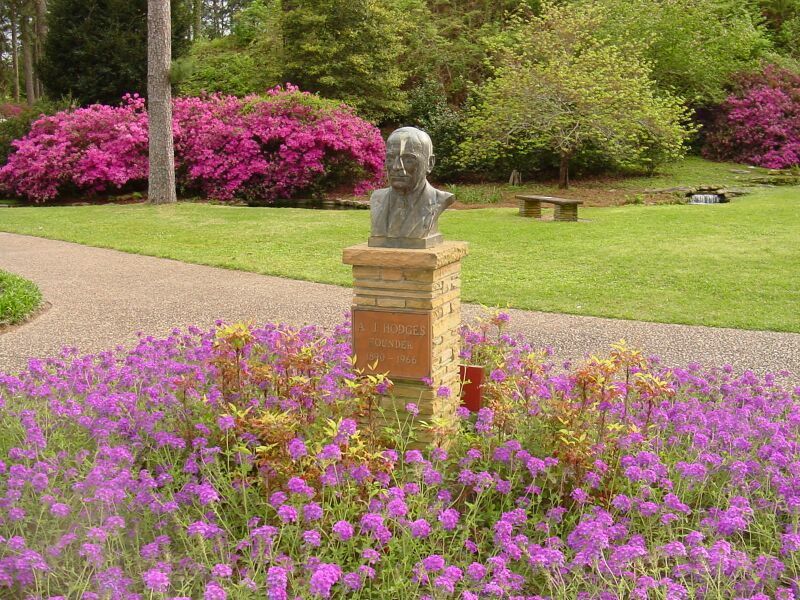 3rd Annual East Texas Spring Ride to Hodges Gardens, La., April 6-7th, 2002. Saturday, Will it rain or not? I have been telling everyone to show up here at my home by 9:30am so that we can leave by 10:00am. Getting a group of people organized and moving is quite a challenge. Will Bird and Achim Felber arrive about 9:15. 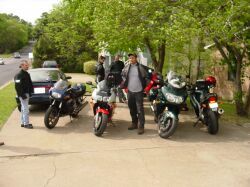 They decided to ride in this morning from Austin. I can tell it was a cold ride when I shake their hands. Will informs me that they rode through a little bit of rain on the way over, but otherwise it was a nice ride. So now I'm wodering if we can get this show on the road and race across East Texas, staying ahead of the rain until we can see the Gardens. A few minutes later, Pete Diaz rides up on his Triumph Sprint ST. 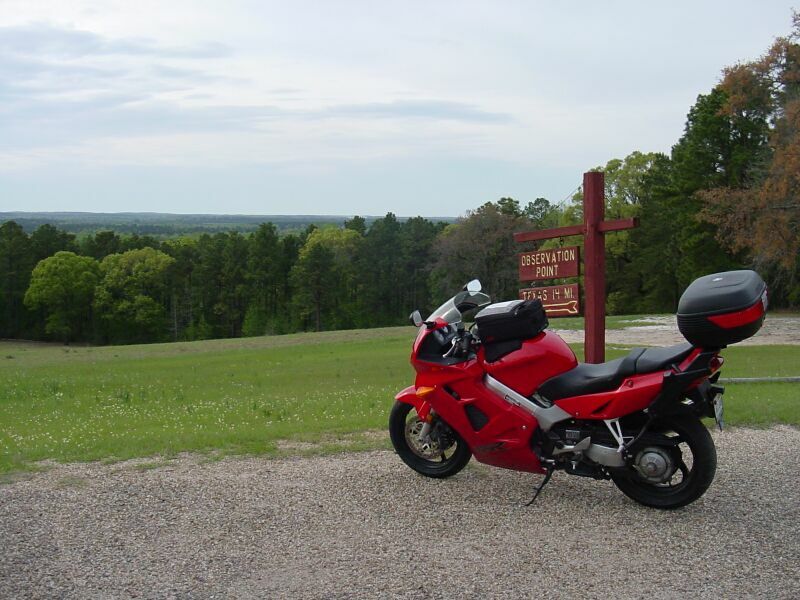 While I am inside doing last minute stuff, David and Deanna show up on their 97 Honda VFR 750. 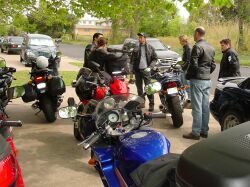 Everyone is hanging out in the driveway doing the introductions and scoping out everyone's bikes. 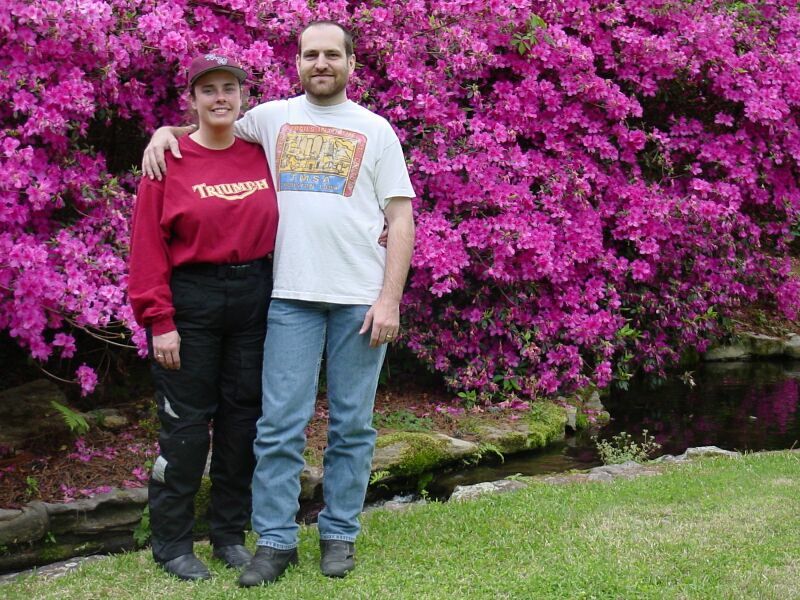 The last to show are Mike and Charlene Guillory. 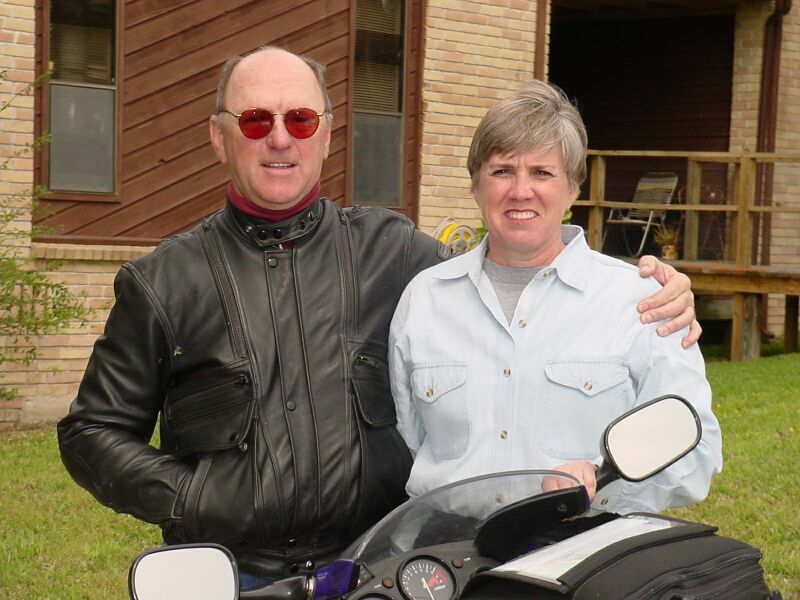 Mike won't be coming along, he just rode up with Charlene on his "Ducati". Have I mentioned that Mike is a peculiar character? Hehe. 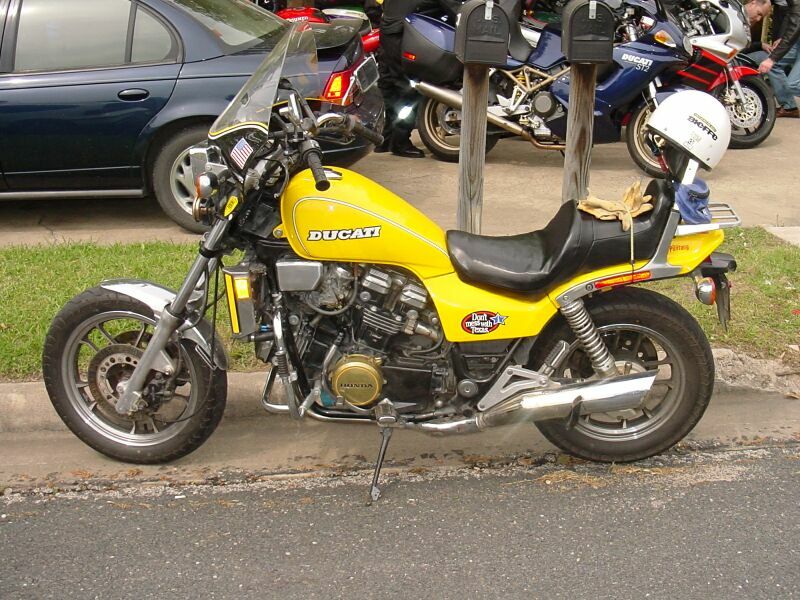 Scott and Duanne call and let us know that they are down in Conroe having a tire put on Scott's Bandit 1200. Scott and I confer for a few minutes to help them figure out what route they want to take to get from Conroe to Jasper where they will meet up with us for lunch. They expect to get away from the dealership by about 10:30am so that should be just about right. With them taken care of, I grab my stuff and head outside to get the gang on the road. After a quick rules of the road briefing, we saddle up and head out into the cool grey overcast morning. Most everyone needs gas, so I decide to hit a gas station on the way out of town. Then Pete needs a rain suit, David and Shane need air in their tires, so we stop by my office just down the road. I give Pete a Tourmaster rainsuit that used to be my Dad's. He no longer rides so I figure Pete can get some use out of it. Of course while we are at the office, several folks have to take potty breaks. It is about 11:00am by the time we are finally on the road and actually leaving town. Not bad, only an hour later than I was shooting for. We head out of town on FM 980. The wildflowers along the side of the road are blooming nicely. Beth and Charlene bring up the rear. I like having Beth back there because we can talk to each other with our communicators and it helps to keep track of everyone. I lead the way because I seem to be the only one to have actually looked at a map and checked out the route hehe. Besides, I like having a clear road ahead of me. We slip along the back road, past the Prison Hog Feeder Slab (phew! ), past a few prison units, and out towards Riverside. 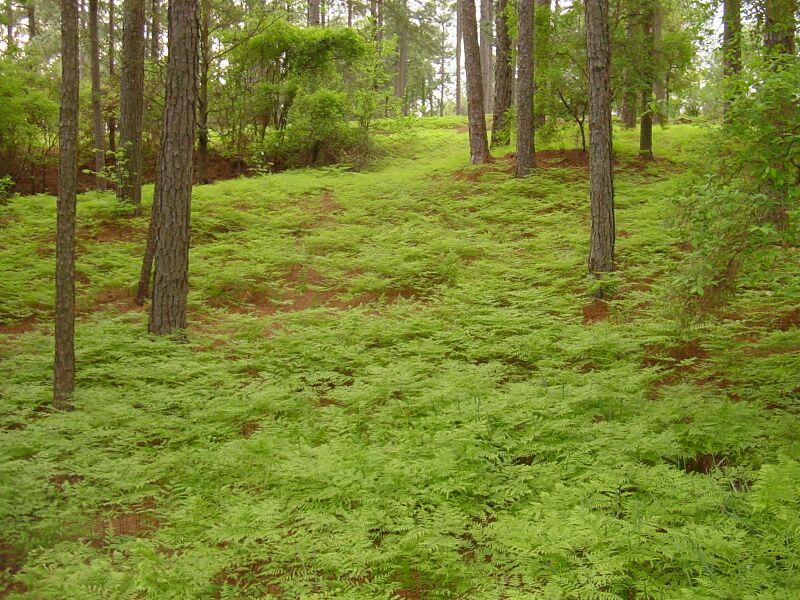 Everything has a lush soft green hue from all the new vegetation and spring rains. We run FM 980 all the way out to Waterwood Parkway. This road cuts over to US 190 and is a real sweet stretch of pavement. There are no side roads or driveways for seven miles. It just wanders back and forth, up and over the hills through the piney woods, in a seamless series of highspeed sweepers. Right before it hits 190, there are some open pastures and a large median, Blue bonnets are scattered everywhere. US 190 is one of those "get from here to there" roads. It is a four lane highway that runs from Huntsville over to Onalaska and beyond. It is not tight but it is still a nice gentle hilly ride toward Lake Livingston. We cross the lake and the water is a murky brown. The high winds and recent rains have really stirred up the muck. The water is quite choppy today. Onalaska has all of two or three traffic lights so getting through town is easy and quick. We are about to head back out into the woods. As I pull onto FM 3152, I glance back to see if everyone is making the turn. I see what I think is everyone and then continue on my way. 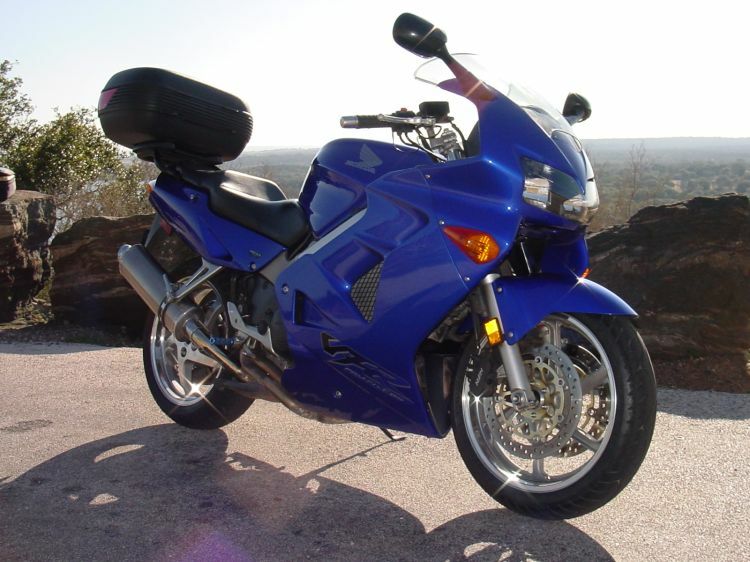 For the first time I finally open up a bit and let the VFR stretch it's legs. 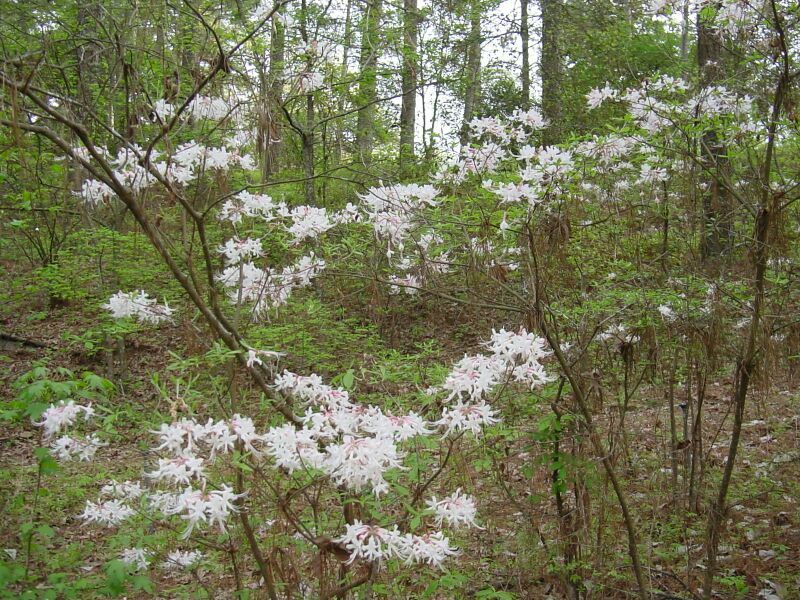 There are lots of Dogwood trees off in the woods on both sides of the road. 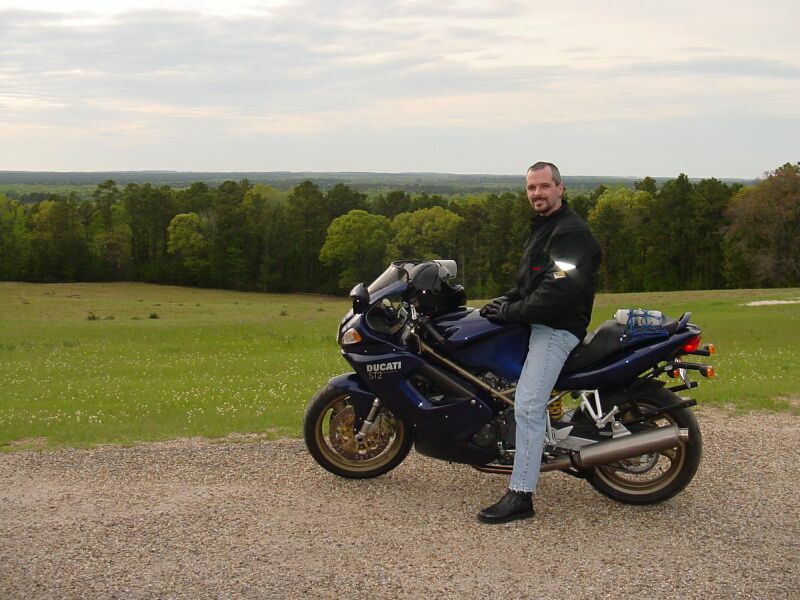 I catch a glimpse of the headlights from the other bikes in my mirror, stretching off into the distance behind me. I love it. FM 3152 is relatively short and in a few minutes I reach the end of the road and stop to wait for everyone to catch up with me. Only four people pull in behind me. Hmmmm? We wait a minute or two and then Brian comes zooming around the corner and stops. He tells me that Achim and Will missed the turn and that Shane has gone off after them. The blind leading the blind, good grief. We stand around talking when finally they come roaring up behind us. Apparently Achim had pulled over and Will stopped with him. Then they did not see us make the turn off of US 190 on to FM 3152. I printed up the route and made sure everyone had a copy before we left the house for just this reason. But I doubt if either of them had a map with them hehe. With everyone back in the group, we head South on FM 350 for a mile or two until we reach FM 942. This is where the really good part of the ride starts. I have never encountered much in the way of traffic on this road in my past rides out here. Today is no different. The road has great pavement and predictable curves. 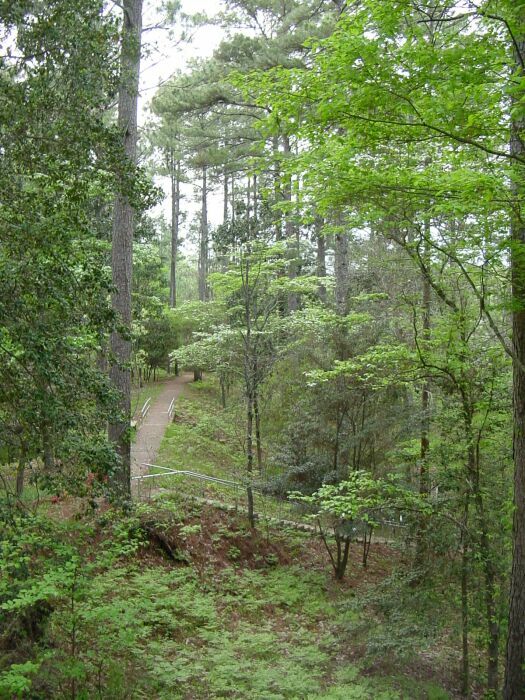 Soon we are zipping along through the lush woods. The recent rains have made everything look damp and wet, except the road. The trees have just come into full spring time foiliage, their leaves still fresh looking. The wild flowers are blooming so thick that I can smell them as I go by the many patches on the sides of the road. 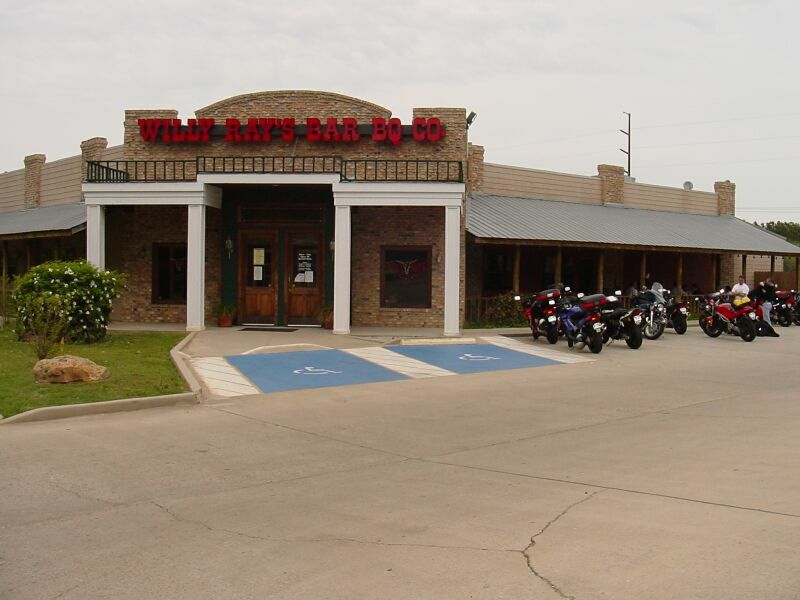 Before long, we roll into the small town of Leggett on U.S. 59. We make a quick jump down US 59 to the point where FM 942 disappears off into the woods again. The stretch between Leggett and Barnes is the best part of the road in terms of sheer fun twistiness. At Barnes, we round a pretty fast left hander and our next road is on the right, right at the exit of the turn. The first few times I did this road, the turn onto FM 1745 took me by surprise. This time I am ready for it and I start flashing my brake light going into the turn to let everyone else know to be ready for something unexpected. After turning, we pull over on the shoulder to wait for everyone to catch up to us. We had been cutting through the woods at a lively pace, a pace a little quicker than everyone wants to ride. So we giggle like little girls and recount our impressions of the road until everyone arrives. The short stretch of FM 1745 from Barnes to Chester is quick and fun. When we reach Chester, we stop at a local Exxon gas station for a break. 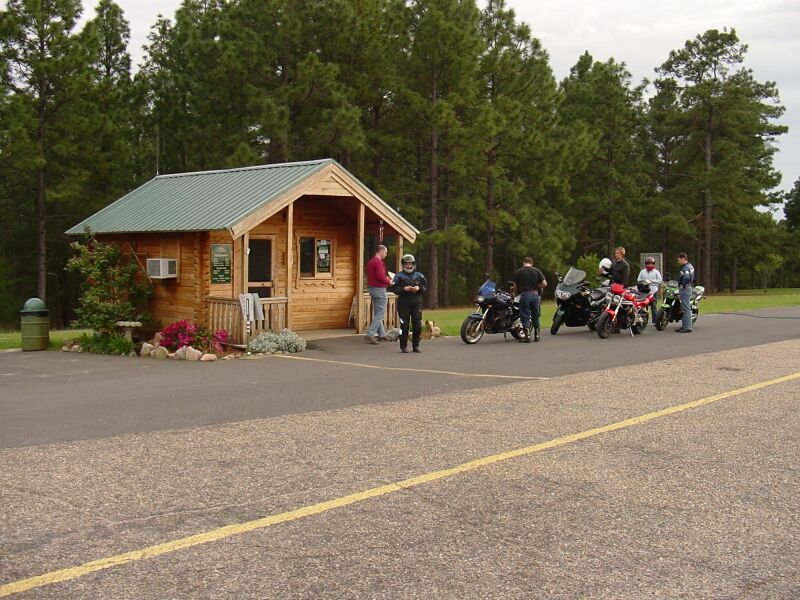 Some of the bikes already need gas, everyone needs to stretch and some of us need a nature break. It also gives us some time to share our excitement and enthusiasm about the ride with each other. While we are relaxing, an odd assortment of bikes comes parading by us. 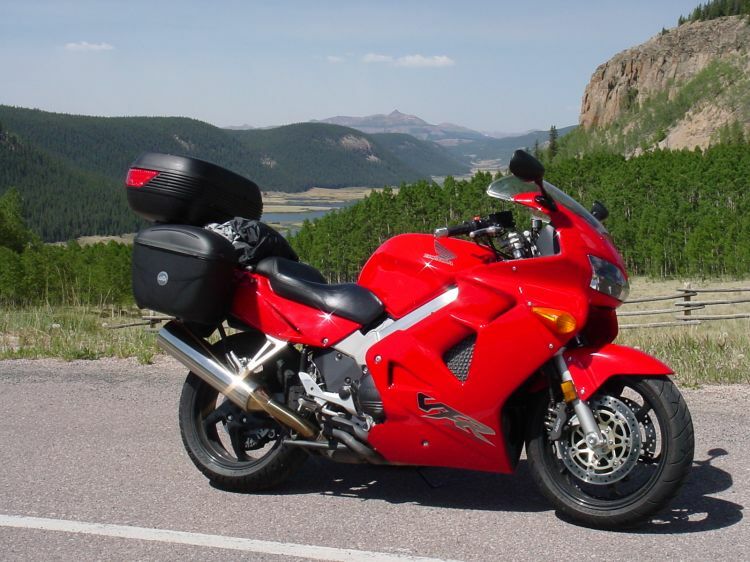 It is a mix of cruisers, sportbikes and tourers, all heading the way we just came. We give them a wave, knowing how much fun they will be having in the next few minutes. We rest for about fifteen minutes and then get back on the road. Having left late, I am worried about our arrival time in Jasper. We are still trying to meet Duanne and Scott for lunch. It is about 12:30pm and we still have a little over an hour and half before we get to Jasper. We get back on the road and make the short jaunt south on US 287 to the point where 1745 continues on through the backwoods. As we leave the outskirts of town, there are many small wood frame homes along the road. 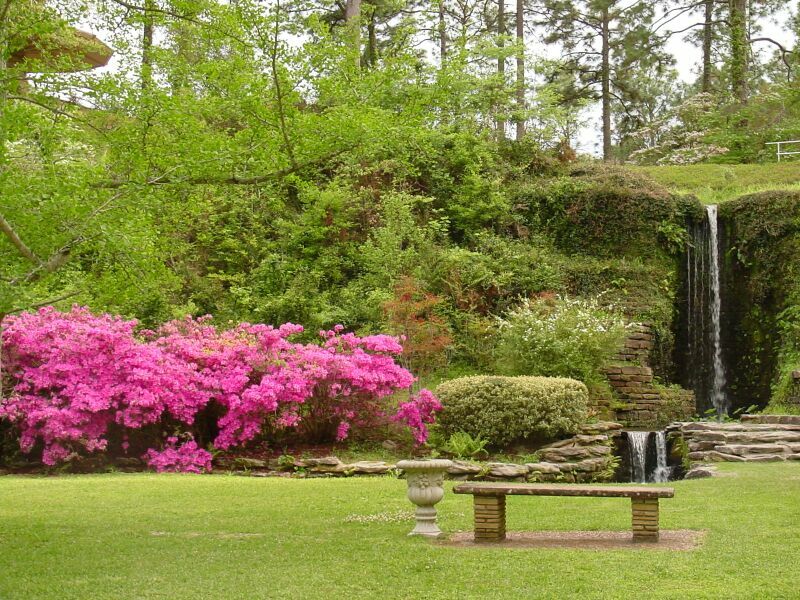 Most of the yards are full of large blooming Azalea bushes and clumps of Wysteria vines. The variety and richness of the springtime colors and textures never ceases to amaze me. As we slip out of town, I pick up the pace again. We have been running a good constant pace, keeping our corner speeds up and using very little braking. This is just so much fun! A few miles outside of Colmesneil, FM 1745 tees into FM 256. For a moment I can't remember where I am and which way I need to be going. Fortunately, we have a minute or so before everyone gets here, and I regain my senses. We head North and quickly reach the town. It is a very small small town. It has maybe a gas station or two and a bank. As we head South on US 69 for a block or so, we pass the gas station and hang a left onto 256 as it heads East out of town. Again we pass small homes with elaborate blooming bushes. This stretch of road is great fun but for one thing, the pavement is a bit rough. When the county road crews came through to "maintain" the road, they simply dumped asphalt out of the back of the dump truck and then spread it with a Grader. Because the road has a hump in the middle of each lane, the asphalt was scraped off the hump and spread to each side of the lanes. Heavy logging trucks have caused the portion of the road where the tires run to sink lower than the middle of the lane. The net result of all of this mess is that the transition between the hump and the extra asphalt is rough. It is also hard to determine if there is loose gravel in the road, something to be watched for in these parts. 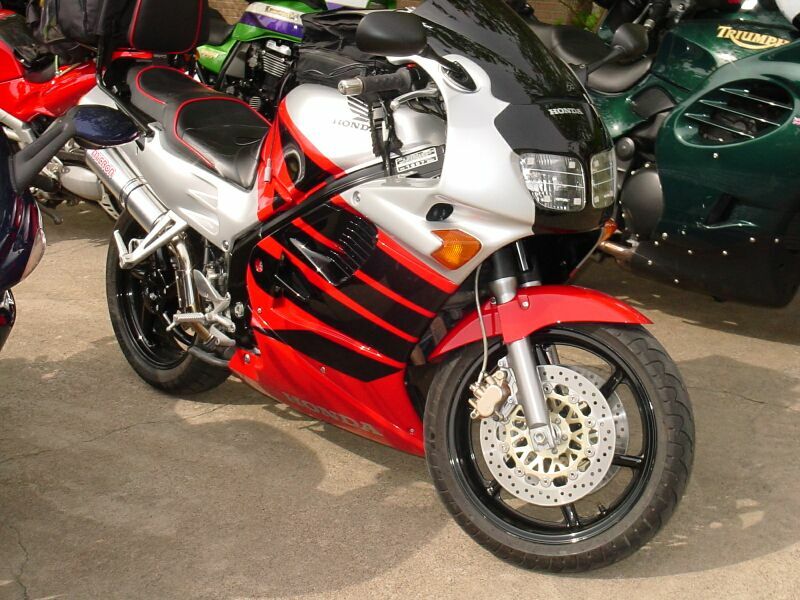 And the roughness gives the front end of the bike a peculiar feeling when I am leaned over in the curves. 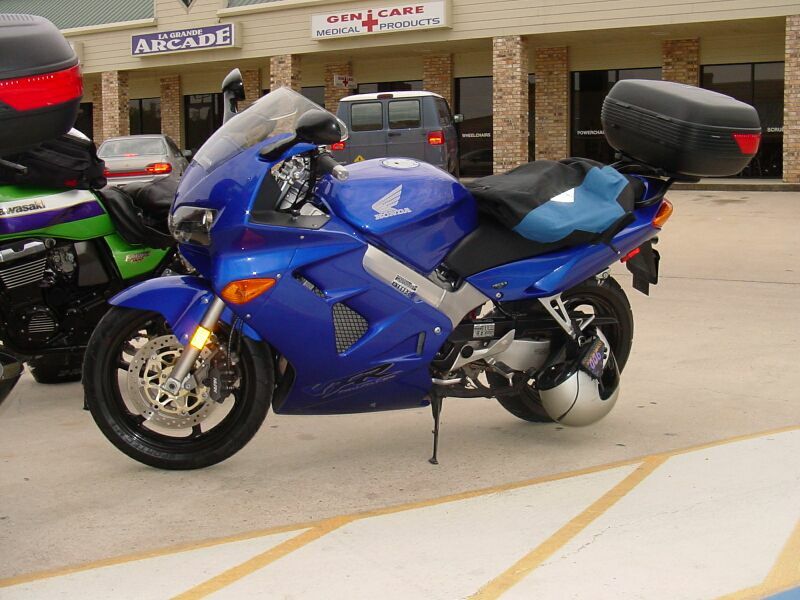 I simply adjust and ride around it and continue to have fun. 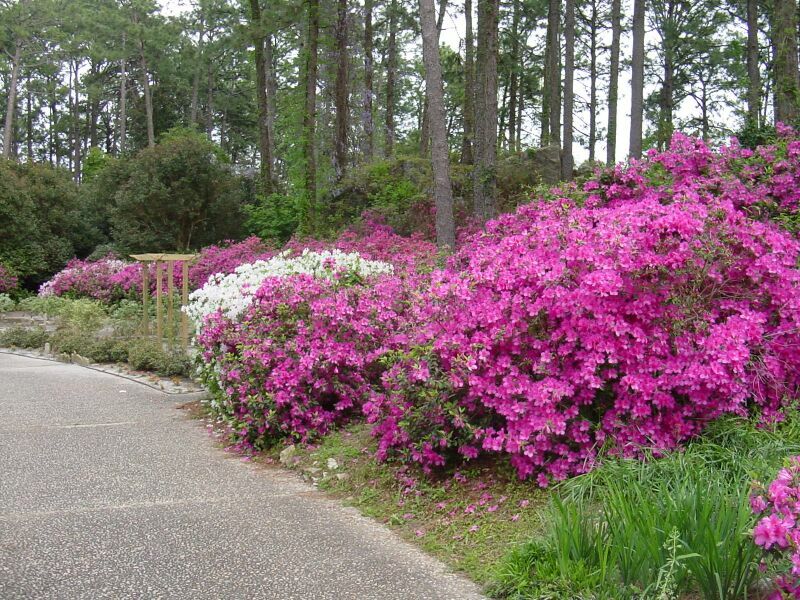 At one point, I come around a curve and am greeted with the sight of a huge line of massive Azalea bushes, all in full bloom. 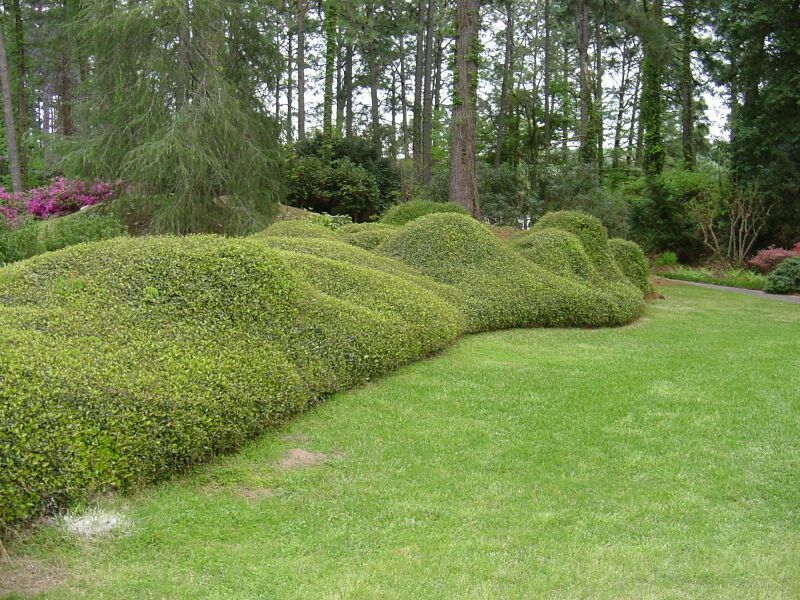 These bushes line the side of a yard and are absolutely amazing. As I pass by, I point them out to the folks behind me. I should stop for a picture, but I hate stopping the whole group just for me to take a picture. And with the uncertainity of the weather behind us, I don't want to waste any time. Before you can count the buzzards on a pile of roadkill, we reach US 190 and the end of the backroads for now. When everyone catches up with us, we turn East and head for Jasper. We are making pretty good time. A few miles after we turn onto US 190, we begin to cross the B.A. Steinhagen Lake. Actually, it looks a lot more like a swamp than a lake. The water is chopped up pretty good from the wind. It is still pretty cool, somewhere in the low seventies, and there is just a little sunlight working its way through the clouds. I glance over at the water and notice that every log I see is covered in Turtles, sunning themselves and trying to soak up any heat they can. In the distance behind us, the clouds are coming, thick and ominous. Another twenty minutes or so and we hit the outskirts of Jasper. When we reach the intersection of US 190 and US 96, we turn North. My plan is to eat lunch at PC's BBQ. This is where Beth and I ate the first time we came out this way. Last year they were closed. At the time it seemed they were closed for remodeling. So I figured after a year, they ought to be done. As we pull into the parking lot, I get a bad feeling. The sign has been blacked out with paint and the place looks exactly the same as it did last year. Bummer. Fortunately, I have a back up plan. A few blocks back the way we just came there is another BBQ place. It was not open last year, they were putting the finishing touches on the construction of the building. From the outside it looks good. Lo and behold, guess who's bikes we see in the parking lot? It seems that Scott and Duanne found PC's closed and came here also, great! They are just finishing up their meal as we walk in the restaurant. But they hang out with us and visit until we are ready to leave. Inside, the palce looks pretty good as well. They have nice decorations, lots of dead animal heads on the walls, etc,... But their all you can eat buffet is $10.95!! Apparently, these country folks can pack it away. Realizing that I could never eat enough to justify that cost, I opt for a sandwhich. The waitress offers to let us use their party room, be we decide to sit outside on their porch (Pic 1 / Pic 2). 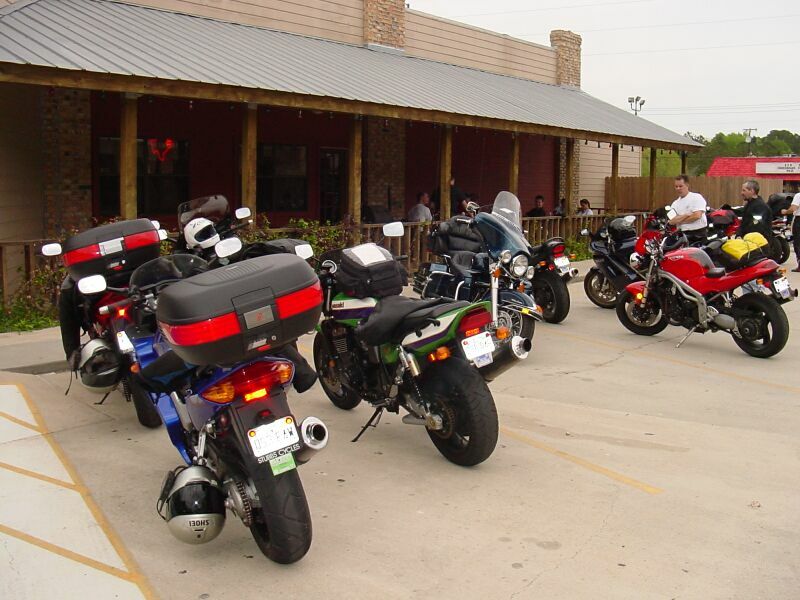 This way we can admire our pretty bikes while we eat and enjoy the cool weather. Since converting Beth's VFR to the OEM blue bodywork, I have been lazy about taking pictures of it. So I snap one for grins. Usually the blue is hard to get to expose properly, however my new digital camera seems to actually have exposed it right. Lunch is slow in coming. I can't imagine it takes very long to slice some sausage and stick it between two buns. We are pretty much the only people in the place. but we still wait over fifteen minutes before we see any food. To make matters worse, it really isn't very good. Thank goodness it was not expensive. Well, except for Pete. He opted for the buffet and is done eating before we even place our orders. I don't think I'll use this place again for any trips. Most everyone in the group feels the same way. In the lengthy downtime for lunch, the clouds seem to have caught up with us. The wind has picked up a bit and it is getting cooler. I fear that this may get to the Garden shortly after we do, cutting our visit short. 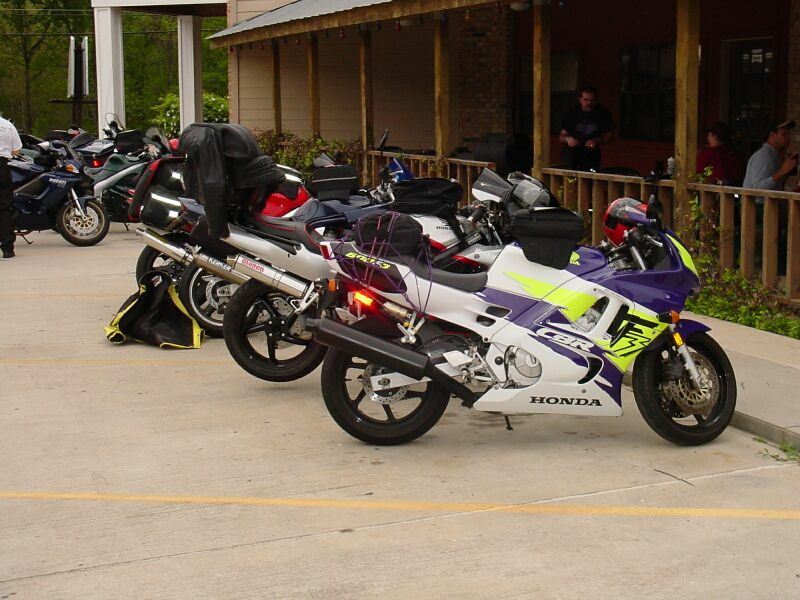 Nonetheless, we suit up and get back on the bikes and head East on US 190 again. Right before we hit Hwy 63, we stop for gas to let everyone top off their tanks. Then we head out on Hwy 63 in a Northeasterly direction. There is not much to say about Hwy 63. It is straight. 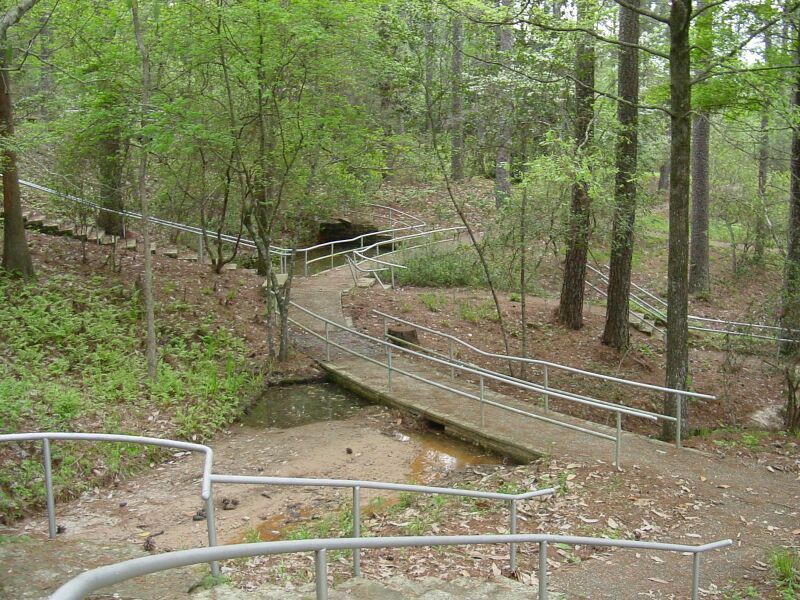 However, it is at least hilly and rides like a roller coaster, up and down, up and down. There are quite a few Dogwood trees blooming along the edge of the woods. It is nearly 3:00pm and I want to get to the hotel and get checked in so we can see the Gardens this evening. Since there are no curves, I bump up the speed a bit. 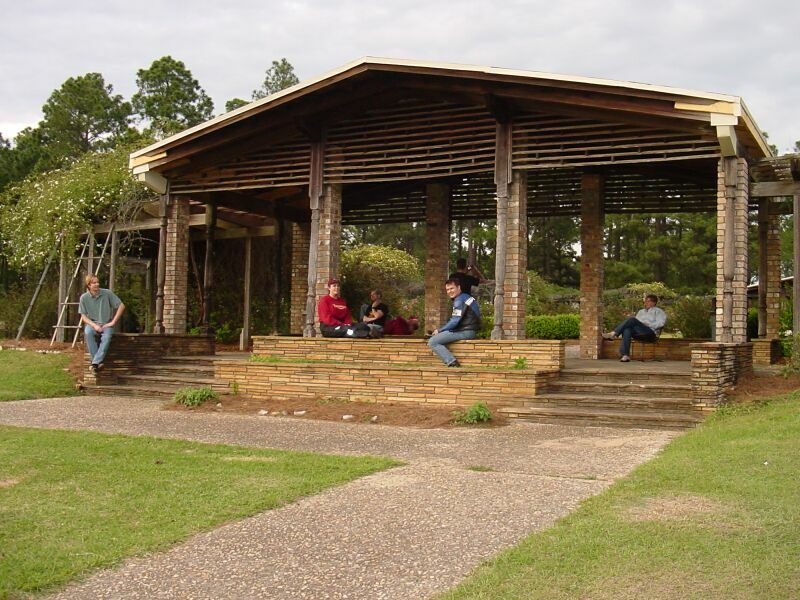 Before long we reach the outskirts of Burkeville and turn onto FM 692 and head for the Southern end of the Toledo Bend Reservoir. I really like this road. The pavement is smooth and predictable, as are the curves. Unfortunately, quite a bit of the scenery has been cut down and not yet replanted. 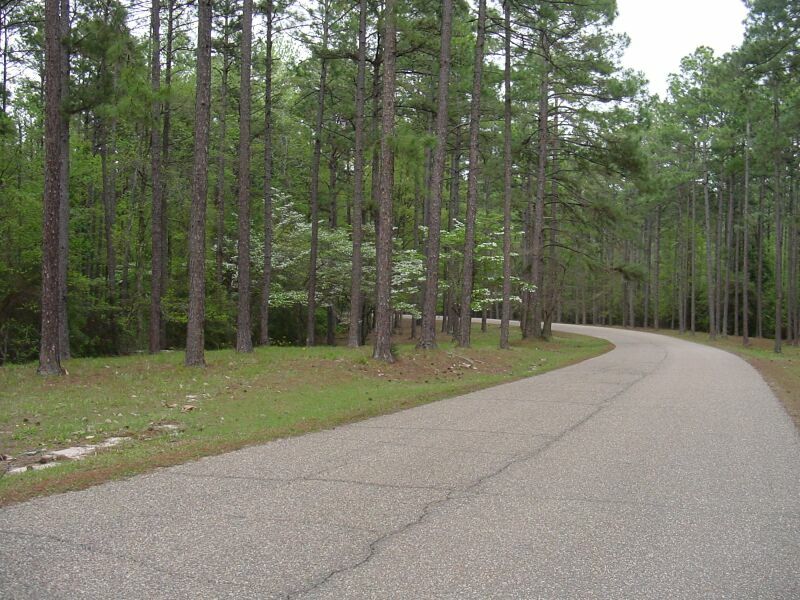 However, we pass through several areas where the woods are still thick and right up against the road. I really love the feeling of zooming up and over these quick rises and around these quick turns. It really gives me the feeling that I am flying. 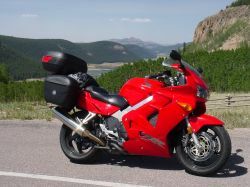 And when I am focused on the road, I don't see any part of my bike in my field of view. It is just the view out the window of my mind with all the scenery rushing at me. Speaking of things rushing at me, there is a pretty tight left hander at the base of the reservoir dam. I slow up a bit and setup for it. I get wayyy over as I hold the line through this corner. 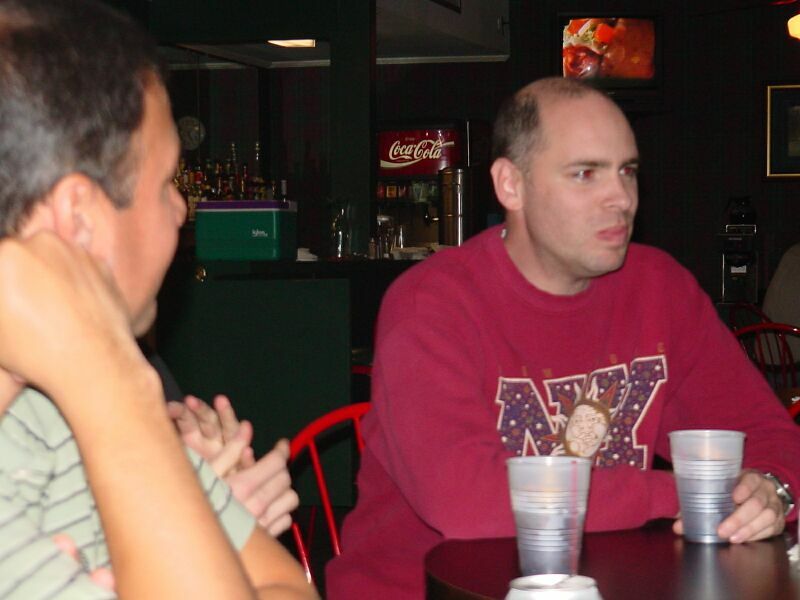 I notice the fellows behind me doing the same. I wonder if they were surprised by this curve as well. Right after exiting the curve, we cross the state line into Louisiana and the road becomes Hwy 191 running North along Louisiana side of the reservoir. This road had just been repaved two years ago when Beth and I first came out here. It is still in nice shape, probably one of the best roads I have ever ridden in this state. Most of them have grass growing in the cracks in the pavement. Hwy 191 is smooth, mostly straight with a few fun sweepers, and lots of trucks with bass boats on trailers. 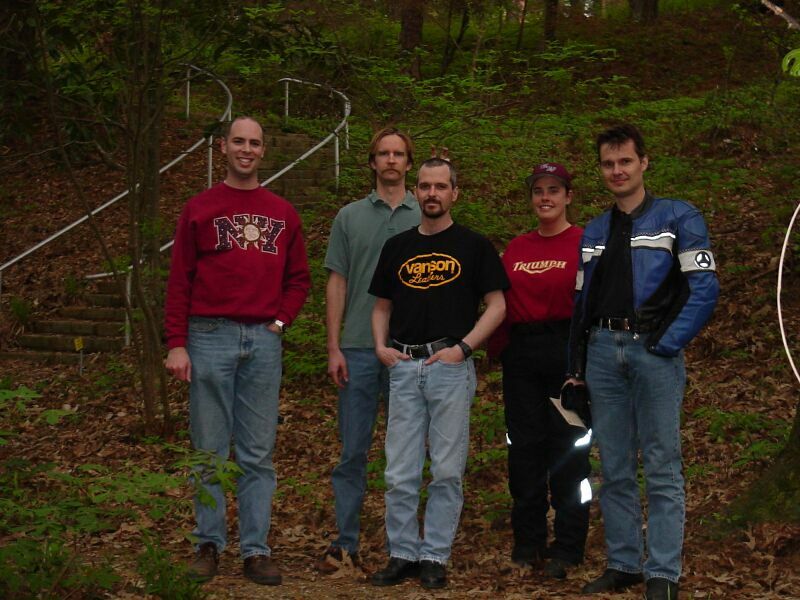 When we reach the next turn, I pull over at a gas station to wait for the rest of the riders. Then we head East on La 473. Did I mention the grass in the roads? This road is a pale brown gravel pavement. It looks really old. Every few hundred yards there is a seam running across the road that gives my suspension a real workout. This is not a road I'd go out of my way to ride, it is simply a here to there type of road. And soon we reach La 392 where we head North for a mile or so to Hornbeck. Here we turn North on US 171. This stretch of highway was under construction the first time we came here a few years back. I swear it looks exactly the same now as it did then. I really have to wonder how much of the funding for this project is actually making its way to the pavement and not into retirement accounts and the like! The road is bumpy and narrow. Fortunately, we only have a few miles to go before reaching the Emerald Hills Inn where we will be staying for the night. The entrance to the Gardnes is just across the road from the parking lot of the Inn. We arrive at the Inn and start checking in to our rooms. It is about 4:00pm. As we all start to wander off to our separate rooms, one of my pet peeves starts to kick into action. I can't stand it when you show up as a large group, with reservations already made weeks before, and the hotel puts us all over the place instead of grouping us near each other. A minor irratation I know. As Beth and I are putting our stuff in our room, I start chatting with a woman leaning over the upstairs rail and admiring the bikes. When I tell her that we are getting ready to head over to the Gardens, she informs me that they stop letting people in the park at 4:30pm!! It is now 4:15pm. Beth and I hop on my bike and run over to the entrance to double check. The gate keeper informs me that as long as we get there by 5:00pm she'll let us inside. Greatly relieved, we head back to the hotel to inform the others. Most of us head over immediately. The entrance is literally right across the road from the hotel. Because of the ongoing road contruction on US 171, there is quite a bit of loose gravel between the road and the actual gate. But we go slow and get to the pavement without any problems. Once inside, the road is a narrow winding asphalt strip. Blooming Dogwood trees line the edges of the woods on each side of the road. I think to myself that this would make a fantastic driveway for a home set back off the main road, especially if you own a motorcycle! We reach the gate and everyone starts to pay the modest entrance fee. While Beth takes care of that for us, I park off to the side to engage in a little photography. Everyone forks over the cash and we wander down into the main garden area. The road curves as it starts to descend down the hill toward one of the earthen dams that helps to form the main lake. After crossing the dam, the road heads back up hill under an overhang of Oak tress draped in long whisps of Spanish Moss. It is really a surreal scene. I'm still kicking myself for not having stopped to get a picture of it. We park in the main lot and start to make our way over to the formal manicured part of the main garden. A month or so ago, I broke down and bought a digital camera. After spending untold hundreds of dollars on film and developing, I figured it was high time for me to step into the 21st century. This trip is the first chance I have had to really get out with the camera and see what I can do with it. I like to take lots of close up shots of things. This eliminates the background clutter and isolates the subject. Often the effect is really cool. However, my luck on this venture is not so great because I still have not got all the features of the camera memorized. Still, some of them are pretty good. 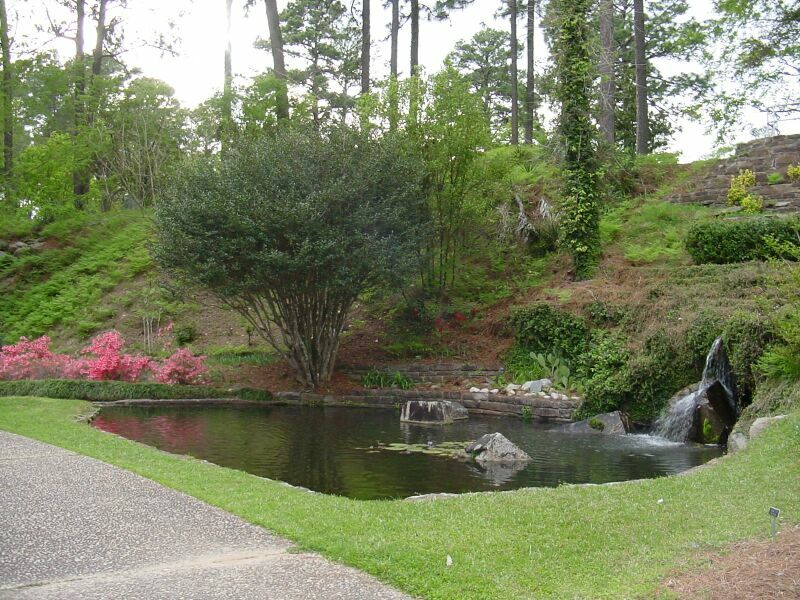 My favorite place in the formal garden has waterfalls, a manicured lawn, and huge beautiful Azalea bushes. 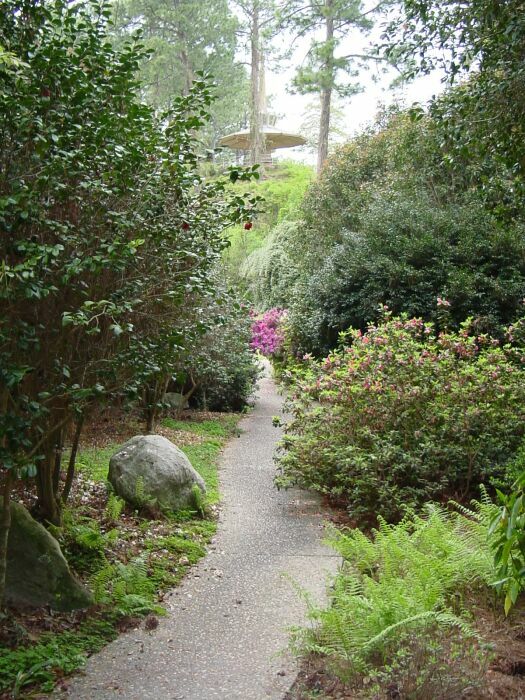 A pebble stone walkway wanders around. The sound of running water is all around us. The evening sun is filtering through the trees overhead, giving the garden a soft warm look and feel. I start taking pictures in earnest ;-) The secret to good photography is to take lots of pictures. So here you go! 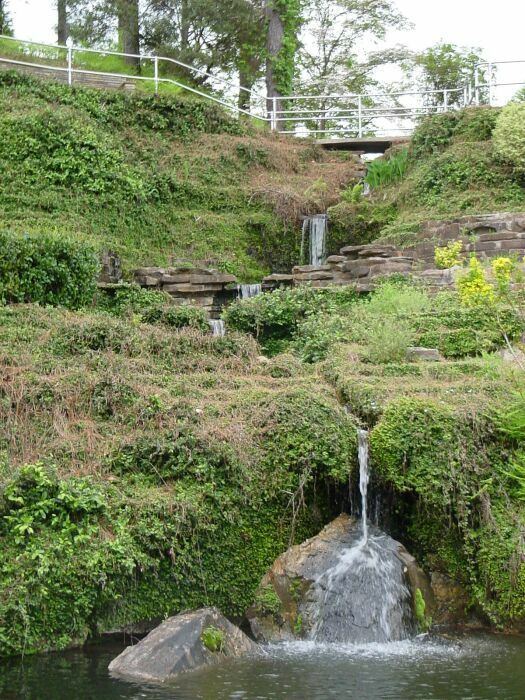 One of the many waterfalls in the formal area. 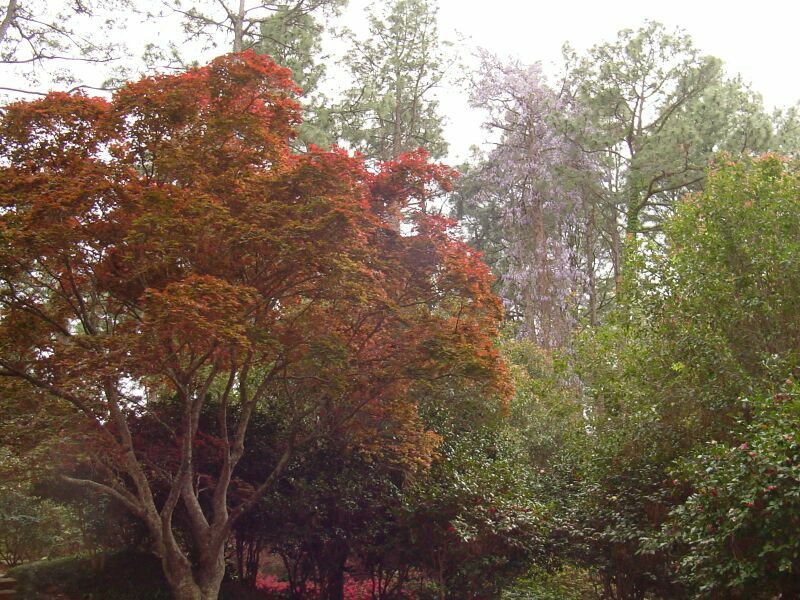 One of several magnificent Japanese Maples. Notice the large Pine tree in the background that is completely covered in a massive Wysteria vine. Another trail. 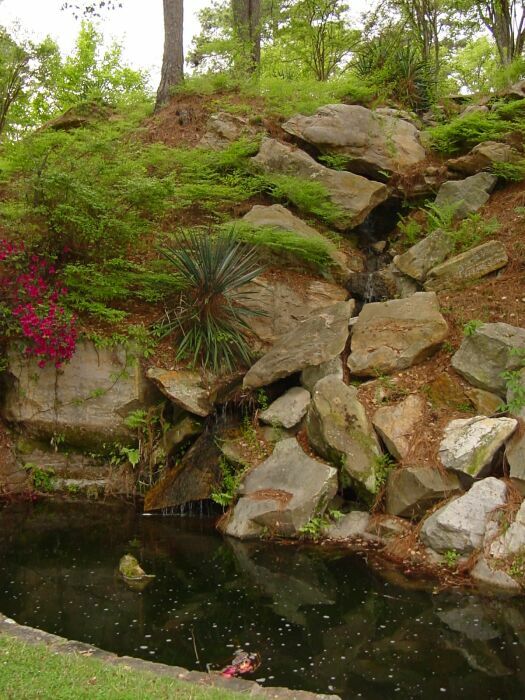 This one leads back to the overlook tower, the highest point in the Gardens. Ealier I mentioned the pine needles looking like christmas tree tinsel, here it is. 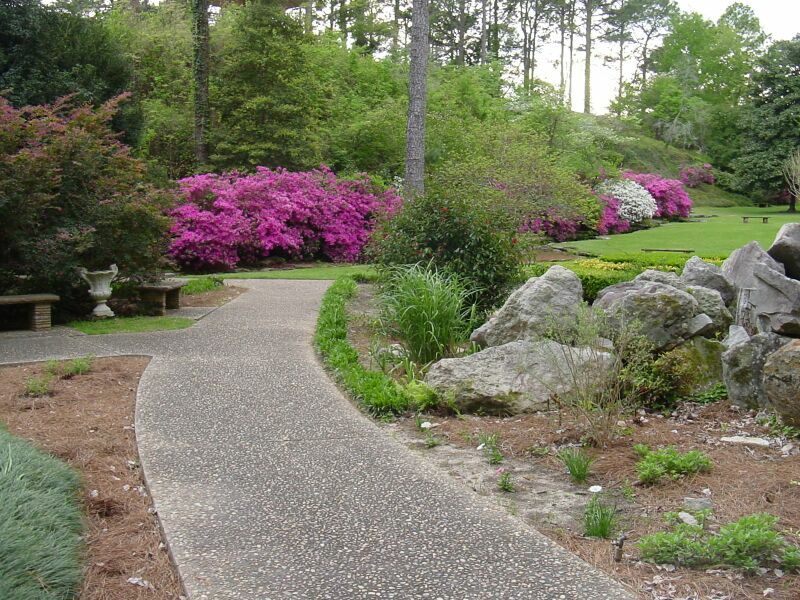 A nice view looking along a long row of Azaleas. Another hidden trail crammed between the bushes. An alien blob overruns the landscape. 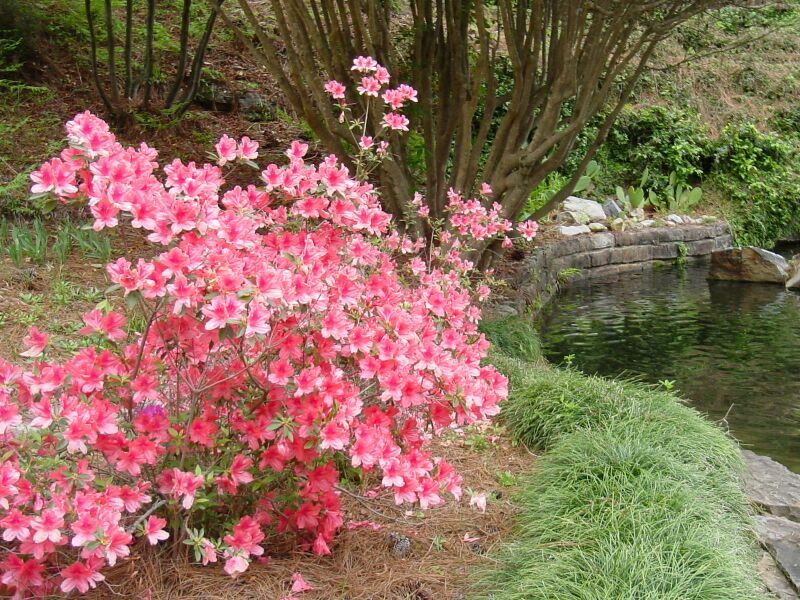 A different variety of Azalea. 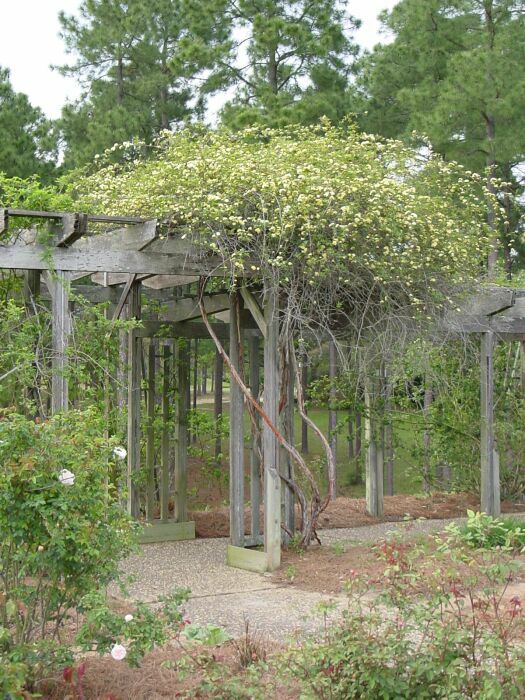 A climbing rose in the formal rose garden. Taking a break outside the formal rose garden. 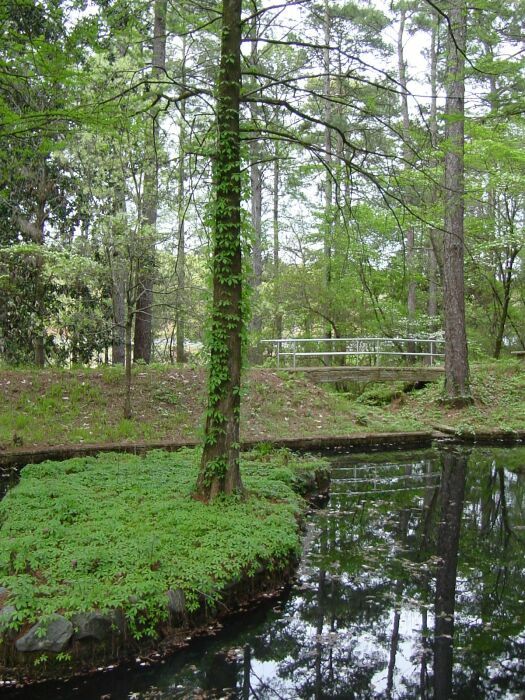 After enjoying the clean uncluttered look of the formal garden area, Beth and I decide to wander through the natural area. 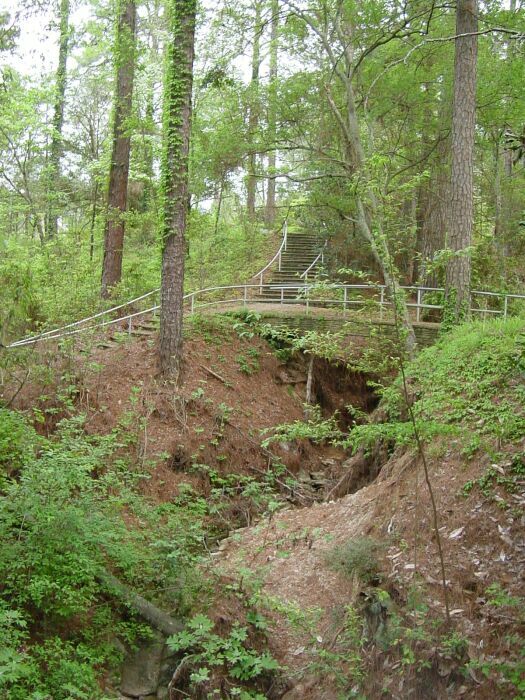 It has a maze of trails that wander through the woods over creeks and gullies with bridges and walkways everywhere. 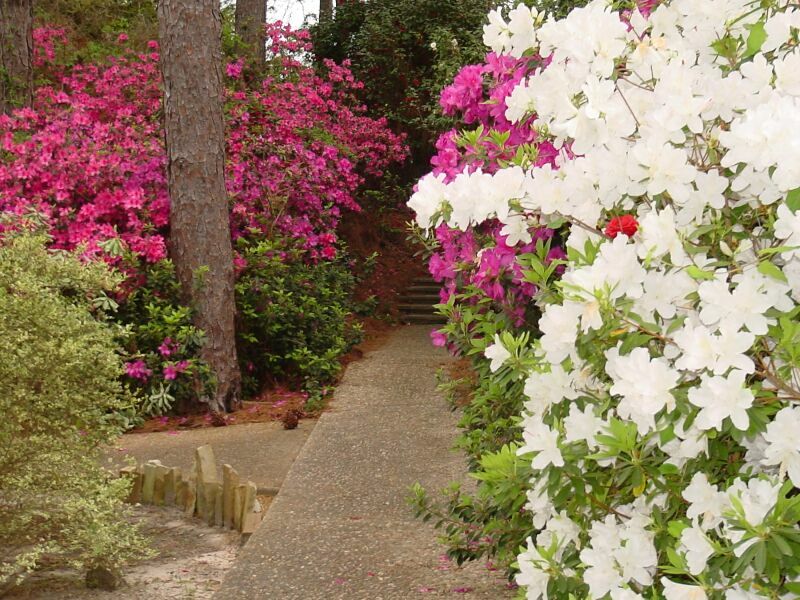 As we descend down on of the walkways, the sweet smell of the blooming flowers is almost overpowering. Brian, Shane, Will and Achim follow close on our heels. Charlene and Scott Bass head back to the hotel. We see them ride by on their way around the lake. Trails One / Trails Two / Trails Three, which way? Hoodlums at large: with flash. 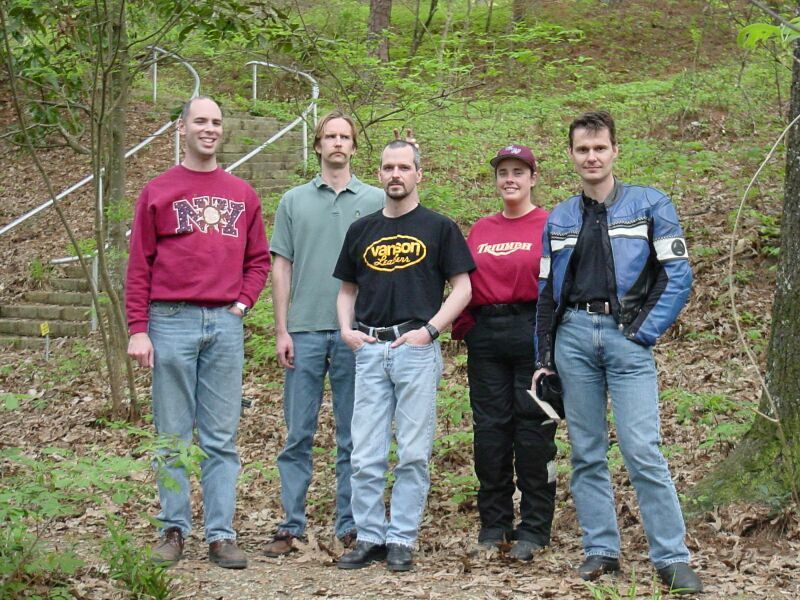 Left to right: Shane Christian, Will Bird, Brian Jones, Beth Friday, Achim Felber. Hoodlums at large: no flash. After wandering in the natural area for a while, I start realizing that I am getting hungry. I ate a light lunch and it is getting to be after 6:00pm. Then I realize that we are at the bottom of a hill. Ugghh. We start the trudge upwards. Can it really be that hot this early in the year? I must really be out of shape. As we reach the top of the trail, Beth and I both notice a soft glow off to the left. There is a beautiful Oak tree glowing in the evening sun. 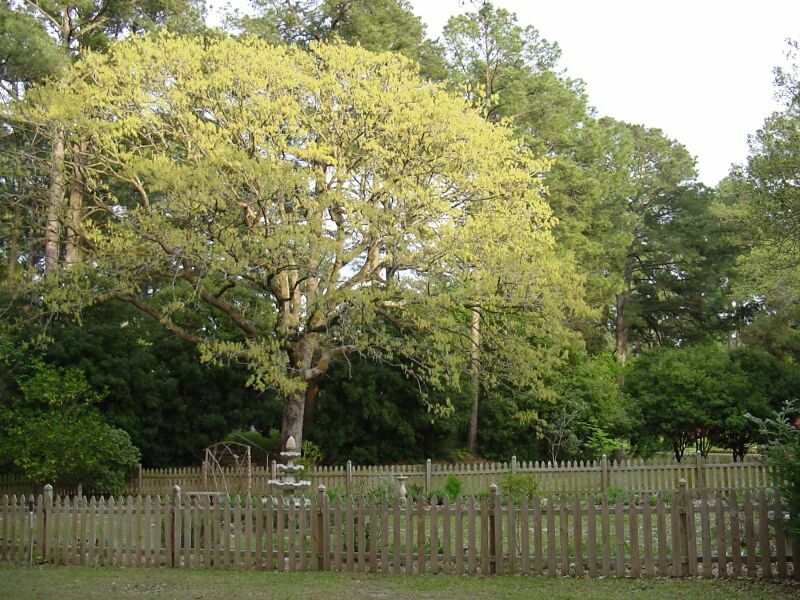 The tree is covered in yellow pollen clusters that refract the sunlight in every direction. 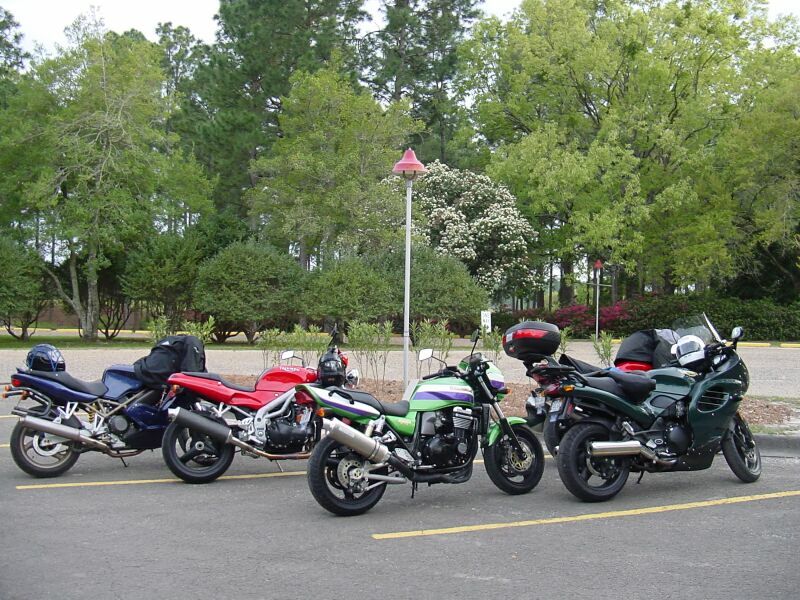 We make our way over to the parking lot where the sight of our lovely steeds greets us. 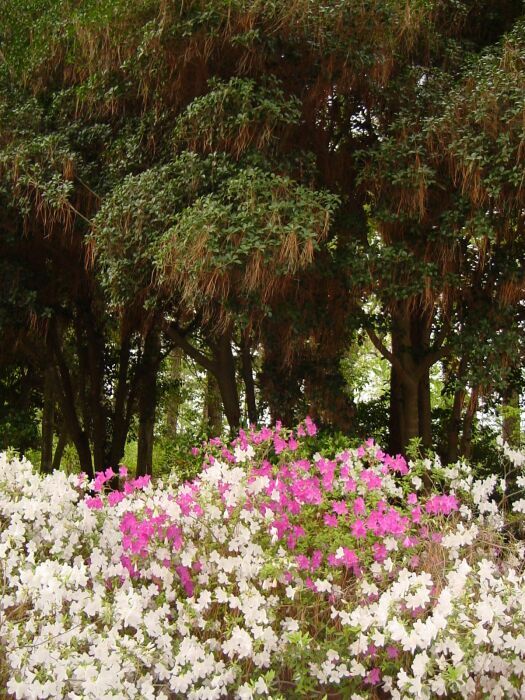 As we are getting ready to leave, I glance back and see a huge row of Azaleas that really show how hard they have recently been beaten down by the rough weather. Last year all we could see was blossoms and no part of the actual bush. We decide to do the lap around the lake before leaving the park. The road is narrow and winds up and down through the woods. Everywhere there are large Dogwood trees displaying their large white blossom on wide spreading branches. When we reach the far side of the lake, Beth and I pull off onto a side road so we can take a peek at the rental cabins overlooking the lake. They are all woodframe cabins located on the end of a small penninsula, each looking out over the lake. The large cabins sleep about 10 people and the small ones hold 4 I think. The most expensive rents for about $125 per night, quite reasonable. We are definitely going to have to return for a weekend in the cabins. We head back to the main road and the exit. As we pass the scenic overlook near the exit, I spot Brian sitting on the ground by his bike. He's sitting and taking in the beautiful evening. We had all been so worried about the possibility of severe weather and it actually has turned into a wonderful evening. We ride by and I enjoy the twisty ride back out to the highway. It's time to get some dinner. 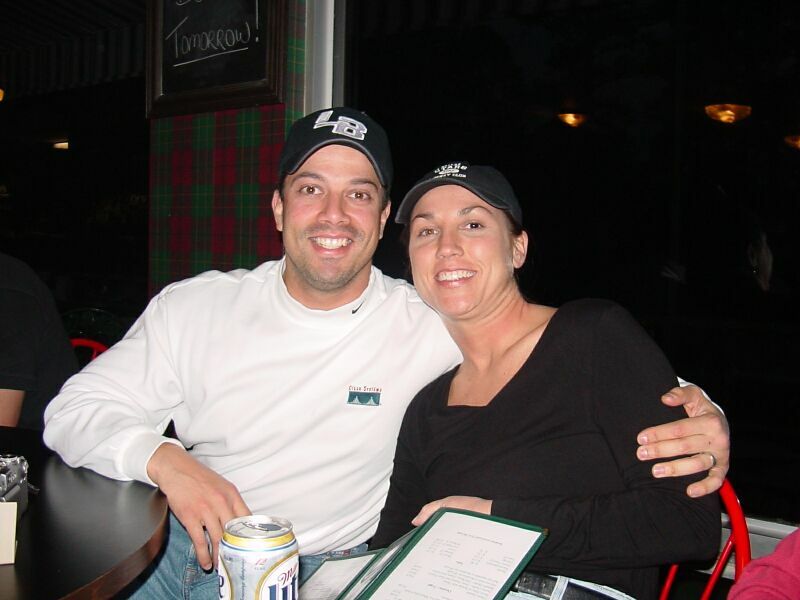 While Beth is busy making herself even more beautiful, I head over to the golf course clubhouse. Fortunately, there is a bar and grill here. The next nearest place to eat is over twenty miles away. Most of the rest of the gang is already here. The view out the back windows is nice. 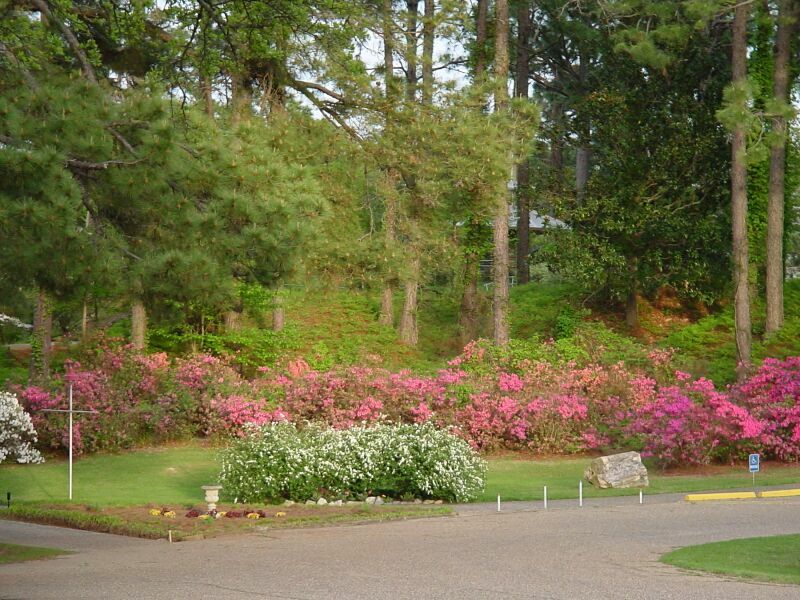 It looks out over part of the golf course, wildflowers and blooming trees fill the landscape. Before long everyone is present and we set about the business of getting our food ordered. 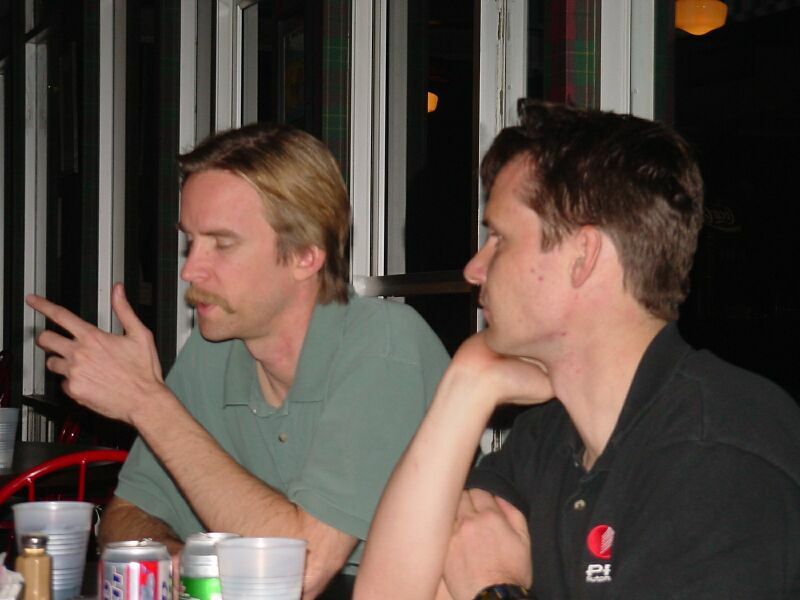 Will's lecturing is putting even him to sleep ;-) Achim is doing his best to look attentive hehe. Shane is finding it hard to swallow, not the beer. When dinner finally arrives, it is delicious. After most everyone is finished drinking, they begin to trickle away to their rooms for the night. Duanne and Scott hang out with Beth and myself a little while longer, kicking back a few extra drinks and getting to know each other. Finally, the waiters toss us out. They were nice enough to let us stay while they cleaned the place. We head back to our room, chat a while longer and then call it a day. All of us can't help but wonder what tomorrow will bring. The Weather Channel is predicting high winds, strong rains, the potential for hail, the end of the world... you get the idea. When my head hits the pillow, I am out fast. It has been a longer day than I thought, but a great one!